"Yes, there were three deals. But TWO were settlements, and one was a settlement only caused by negative publicity. Those two were DC saying 'The original deal — there was nothing wrong with it.' The only deal that really matters is that first deal. That first deal — you basically got the original sin of comics, right there, you know? Why should we treat THAT deal, of all the deals in the history of comics, as sacred? $130 for Superman? Why should we treat that as anything but Beads for Manhattan?" "When I did something like this on a much smaller scale, I remember how much of a relief it was when the court awarded me my share in the characters I'd co-created. (I really ought to do something with it. Anyone want to publish an ANGELA comic? Or Medieval Spawn?)" 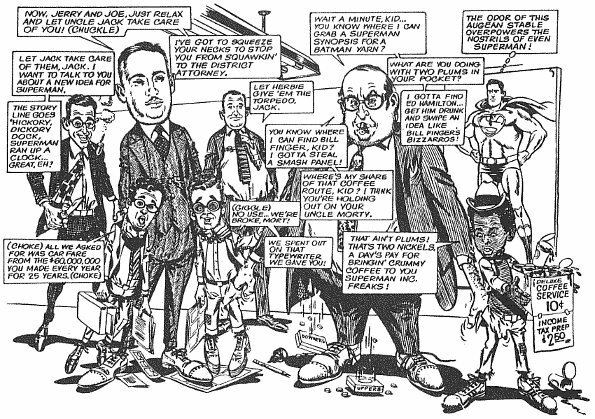 1973 satire of the DC office, written and drawn by longtime Superman artist Wayne Boring, as reprinted in Alter Ego #9. Depicted from left to right are Jack Schiff, Jack Liebowitz with Jerry Siegel and Joe Shuster, Herbie Siegel, Mort Weisinger, unknown. Art ©2001 the estate of Wayne Boring; Superman ©2001 DC Comics. Before we begin, let's take a moment and poke a finger in DC Comics' glorious misfortune, shall we? I wish I could remember where I read it — I'm tempted to credit either Neal Adams or R. Fiore — but one of the most damning things I ever read about the Siegel and Shuster legacy was that it was a refutation of the American Dream. One of the defining principles of the United States, after all, has always been the notion that regardless of the circumstances from which you began in life, if you came up with the right idea or hit the right motherlode you would profit from it accordingly, and pass the wealth along to your family when you died. I don't know if the "rags to riches" story was invented by an American, but it was almost certainly perfected by one. The story of how Jerry Siegel and Joe Shuster brought Superman to DC Comics, and how DC subsequently treated them, turns this notion on its head. $130 and a job — that's what Siegel and Shuster got, and they only had the latter so long as they were willing to play ball. And when Siegel and Shuster did try to better their circumstances, they were quickly shown the door. Jerry Siegel found himself crawling back to DC Comics, writing for their mediocre wages in the 1950s and 1960s, his most famous creation published with no credit for its author and no compensation for its success. 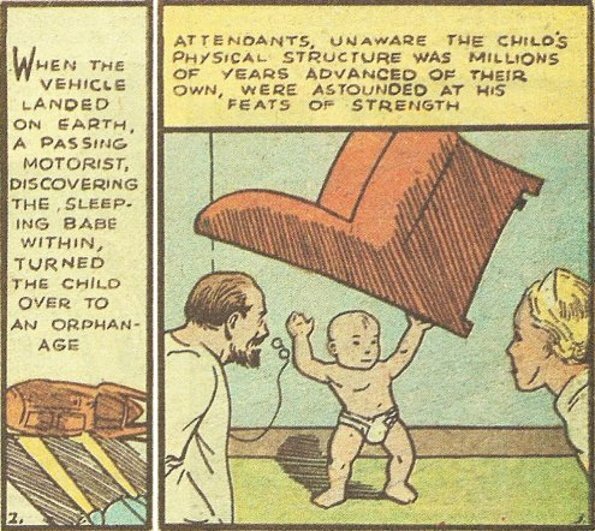 Joe Shuster found himself working for the Post Office, unable to draw due to his failing eyesight and drawing no income for the legendary work that he'd done decades before. Let me address this whole idea implicit in Steve's argument that there is this wonderful proposition called free choice, and everyone could choose to work for these immoral corporations or they could just choose not to. 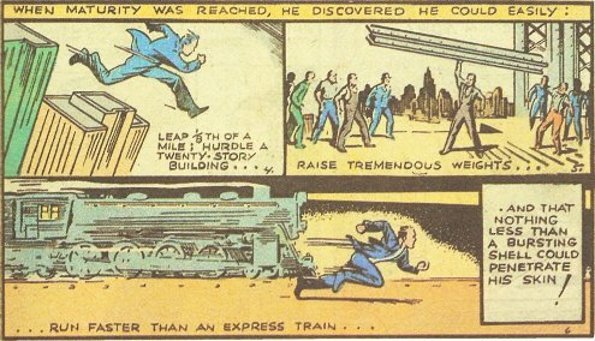 When comics started, which was in the late-'30s, people needed jobs. One of the little difficulties plaguing finance capitalism was that it had just about collapsed and people could not get jobs. Some people could draw and they worked for these companies. They worked for Timely and DC. Every one of these corporations treated artists in the exact same way. There was nowhere else to go if you had any writing or drawing skill, subsistence jobs were hard enough to get doing anything at all. At the time comics started — and this is important — this country was in a depression. People were desperate for jobs. Those people who had money were brutally taking advantage of the situation. Last Wednesday, U.S. district judge Stephen G. Larson issued a summary judgement in the lawsuit between DC Comics/Warner Brothers Entertainment and the estate of Superman co-creator Jerome "Jerry" Siegel, giving half of the copyright to the original Superman story published in the 1938 Action Comics #1 back to the Siegel estate and backdating said ownership to 1999, when the Siegels filed notice of termination. Jeff Trexler broke the news on Friday afternoon and posted a copy of Larson's full 72-page ruling to his website; on Saturday, the New York Times and the Bloomberg wire service had both issued news stories covering the landmark ruling. Both Jeff Trexler and Brian Cronin have crafted FAQs answering basic questions, and Andy Khoury discusses the judgement with intellectual-property lawyer Brendan McFeely. The best reading on the subject is really Judge Larson's summary judgement itself, however: It's an entertaining and informative document that contains a full history of the creation of Superman, a summary of how the case has progressed to date and of course includes Larson's erudite resolution of several important issues involved in the case. Oh yeah, and in the appendix, a color reproduction of the original Superman story itself. Hey kids! Comics! With the passage of the Copyright Act of 1976 (the "1976 Act"), Congress changed the legal landscape concerning artists' transfers of the copyrights in their creations. First, the 1976 Act expanded by nineteen years the duration of the renewal period for works, like the initial release of Superman in Action Comics, Vol. 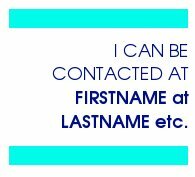 1, that were already in their renewal term at the time of the Act's passage. See 17 U.S.C. § 304(b). Second, and importantly for this case, the 1976 Act gave artists and their heirs the ability to terminate any prior grants of the rights to their creations that were executed before January 1, 1978, regardless of the terms contained in such assignments, e.g., a contractual provision that all the rights (the initial and renewal) belonged exclusively to the publisher. There are two important features of the 1976 act that you need to know about in order to discuss the subject. First, as Larson quotes William Patry as writing, "[i]t is difficult to overstate the intricacies of these [termination] provisions, the result of which is that they are barely used, no doubt the result desired by lobbyists for assignees." Second, the act only applies to works that were originally owned by their creators and then licensed to third parties — creative works made for-hire are ineligible for rights reversion. In April, Jerry Siegel's widow Joanne and daughter Laura filed a termination of copyright transfer which is intended to return the Superman copyright to the heirs of the character's co-creator. The document states that the Siegels "hereby terminate the grant of the transfer of renewal copyright(s) (to the extent of author Jerome Siegel's share in the ownership of the renewal copyright(s)) made in a certain agreement between Jerome Siegel and Joe Shuster and Detective Comics, Inc. executed on or about December 4, 1937." The document states that the termination is intended to apply not just to Superman himself and his origin story but "to each and every work (in any medium whatsoever, whenever created) that includes or embodies any character, story element or indicia reasonably associated with Superman or Superman stories, such as, without limitation, Superman, Clark Kent, Lois Lane, Perry White, Jimmy Olsen, Superboy, Supergirl, Lana Lang, Lex Luthor, Mr. Mxyztplk (also known as Mr. Mxyzptlk), Ma and Pa Kent, Steel, the planet Krypton, Kryptonite, Metropolis, Smallville, or the Daily Planet." To say that this document opened a can of worms was putting it mildly. 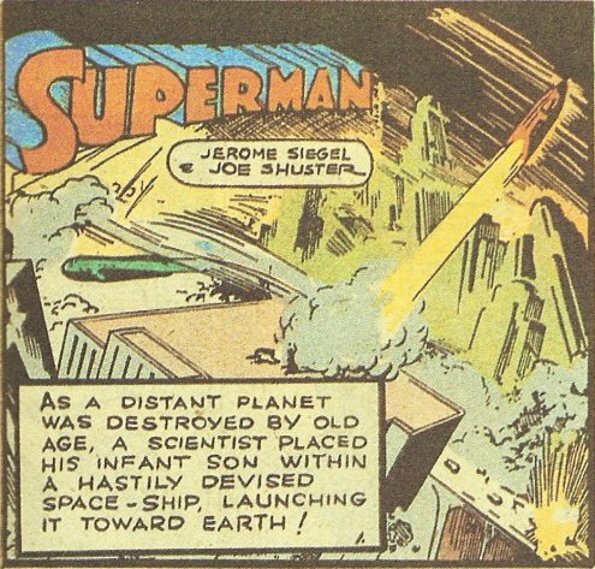 While the original Superman story was created by Jerry Siegel and Joe Shuster long before it ever fell into Detective Comics' hands, subsequent stories were inarguably created under work-for-hire terms. Where does one end and the other begin? The beauty of Judge Larson's summary-judgement ruling lies in the way that it sidesteps these questions entirely by focusing on that first Superman story. By crafting his ruling around Action Comics #1, Larson renders the entire question of work-for-hire moot in one stroke. The Court begins by observing what is not depicted in the announcements. Obviously, nothing concerning the Superman storyline (that is, the literary elements contained in Action Comics, Vol. 1) is on display in the ads; thus, Superman's name, his alter ego, his compatriots, his origins, his mission to serve as a champion of the oppressed, or his heroic abilities in general, do not remain within defendants sole possession to exploit. Instead the only copyrightable elements left arise from the pictorial illustration in the announcements, which is fairly limited. The person in question has great strength (he is after all holding aloft a car). The person is wearing some type of costume, but significantly the colors, if any, for the same are not represented, as the advertisement appears only in black and white. The argument that the "S" crest is recognizable in the promotional advertisement is not persuasive. What is depicted on the chest of the costume is so small and blurred as to not be readily recognizable, at best all that can be seen is some vague marking or symbol its precise contours hard to decipher. The Court thus concludes that defendants may continue to exploit the image of a person with extraordinary strength who wears a black and white leotard and cape. What remains of the Siegel and Shuster's Superman copyright that is still subject to termination (and, of course, what defendants truly seek) is the entire storyline from Action Comics, Vol. 1, Superman's distinctive blue leotard (complete with its inverted triangular crest across the chest with a red "S" on a yellow background), a red cape and boots, and his superhuman ability to leap tall buildings, repel bullets, and run faster than a locomotive, none of which is apparent from the announcement. The thrust of defendants' argument was made and rejected by the Second Circuit in the 1970s Superman copyright renewal litigation, and is thus precluded as a matter of collateral estoppel here. In that litigation, defendants' predecessors-in-interest presented much of the same evidence now submitted in this case to argue that this additional material transformed the entirety of Siegel and Shuster's pre-existing Superman material published in Action Comics, Vol. 1, into a work made for hire. The Second Circuit rejected this argument, elaborating: "In the case before us, Superman and his miraculous powers were completely developed long before the employment relationship was instituted. The record indicates that the revisions directed by the defendants were simply to accommodate Superman to a magazine format. We do not consider this sufficient to create the presumption that the [comic book] strip was a work for hire." Siegel, 508 F.2d at 914. This conclusion forecloses any further litigation on the point of whether Shuster's additional drawings when reformatting the underlying Superman material into a comic book format or other facts related to such a theory such as the colorization process for Action Comics, Vol. 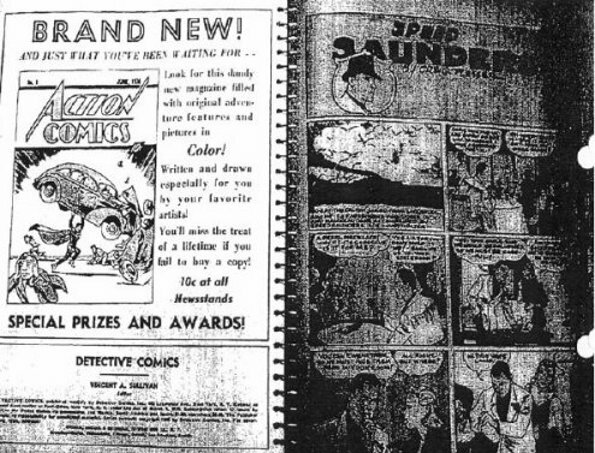 1, or the party responsible for the illustration of the cover to the magazine, rendered all or portions of the resulting comic book a work made for hire. And with that, the way was cleared for Jerry Siegel's wife and daughter to regain partial ownership of his most famous creation. Any number of issues still remain to be resolved. First, there's the small matter of how much money in back payments the Siegels are owed since the character was considered to have partially reverted back to their ownership in 1999. I would imagine that the accounting would be a nightmare, even if Warner Brothers decided to play fair. Furthermore, because the rights handed back to the Siegel estate are so narrowly focused around Action Comics #1, there remains some question as to what extent changes made to Superman since that first appearance constitute a dilution of the character in terms of what the Siegels are owed. Assuming that a settlement isn't reached in advance, a jury will likely wind up having to decide that one. And while it isn't directly related to the case at hand, DC Comics and Warner Brothers have to be watching the clock with some trepidation: While the copyright bill that passed in 1976 only made accomodations for immediate heirs, Congress extended copyright durations a second time again in 1998, at which point the definition was altered to allow for estates to seek copyright reversions as well, at the end of what would have been the end of the copyright at the extra length that Congress gave to it in 1976. That means that the Shuster estate, currently represented by a nephew, will be able to file for exactly the same reversion rights in 2013 as has the Siegel heirs... and this time, there'll be an established precendent from which to work. DC's executives and lawyers have to be shitting bricks over that one. While one would think that this sort of ruling would be an enormous and difficult precedent for the comics industry, that really doesn't appear to be the case. Because the Larson ruling sidesteps the concept of work-made-for-hire, it really only deals with an extreme exception to the rule; few if any original concepts and/or characters currently in use by major comic-book companies can so easily be demonstrated to have been created and produced outside the premises of the company before being licensed for publication. Two borderline examples — Dan DeCarlo's co-authorship of Josie and Marv Wolfman's creation of Blade — have already been struck down by the courts as having been created on a work-for-hire basis. From the perspective of the larger New York corporate-comics industry, then, this really isn't going to change anything save, perhaps, the way that DC Comics' accounting department deals with Superman. And even there, changes won't become immediately apparent until the other issues in the Siegal case are resolved. Until that occurs, DC Comics is still entitled to create and publish new Superman comics, and Warner Brothers is still entitled to make Superman movies and license the characters out to third parties for lunchboxes and whatnot. Still, let's not lose sight of what was achieved. Last Wednesday's ruling was a cause for celebration among those people who believe that artists should be fairly compensated for the fruits of their work, regardless of how small the precendent set or how little the ruling will aid others. It's a small victory in the greater scheme of things, sure, but it's an important one nonetheless: The most fabled screwing of an artist by a publisher has just met with a measure of justice, and the corporate heirs of the original perpetrators have just received the public shaming that their intransigence has more than earned. Last Wednesday, the American Dream began shining just a little bit brighter than it had before. The Journal extends its heartiest congratulations to the Siegels on a job well done. POSTSCRIPT, 2016: Godfuckingdammit. I should have seen it coming, of course: The widow and daughter of the writer behind an iconic American fictional character takes half the ownership back from a major American corporation, and I expected it to end there? Clearly, I'm not enough of a cynic. Of course Time-Warner appealed. Of course they found a judge to vacate the decision and give Superman back to Time-Warner lock, stock and barrel. Of course, of course.